Debra Tate, the sister of one of the Manson family's victims, the actress Sharon Tate, told NBC News that authorities called her about 8:30 p.m. to inform her that Manson was dead. "One could say I've forgiven them, which is quite different than forgetting what they are capable of," Tate said. "It is for this reason I fight so hard to make sure that each of these individuals stays in prison until the end of their natural days." Michele Hanisee, president of the Association of Deputy District Attorneys for Los Angeles County, said Sunday night: "Today, Manson's victims are the ones who should be remembered and mourned on the occasion of his death." "Why did the Manson legend live on? 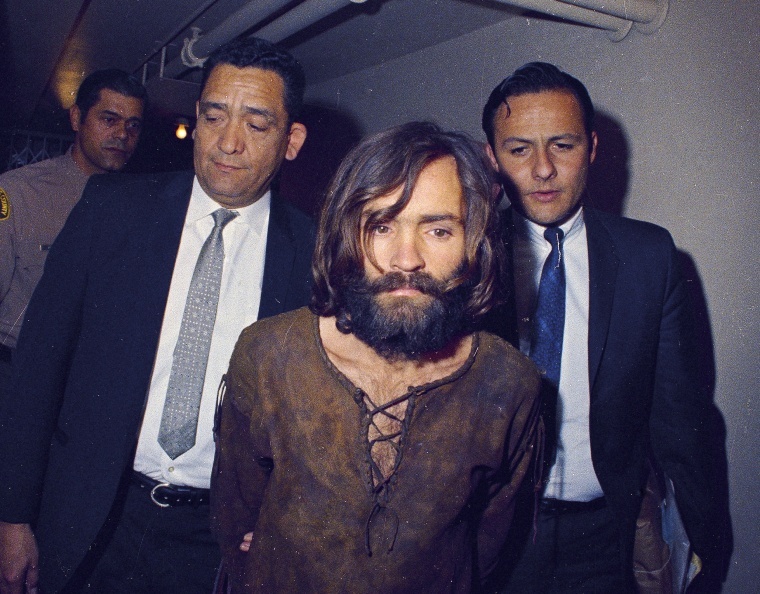 It's because Manson lived on," pop culture expert Robert Thompson, director of the Bleier Center for Television & Popular Culture at Syracuse University, told NBC News before Manson died. During his second stint, Manson befriended Alvin "Creepy" Karpis — a former member of Ma Barker's infamous gang — who taught him how to play steel guitar and planted in him the notion that he could one day be a famous musician. So when Manson was released in 1967, he headed north to San Francisco and then back Los Angeles, where he tried to launch a musical career. He wrote music and hung out with Dennis Wilson of the Beach Boys, who recorded one of his songs on the band's "20/20" album as "Never Learn Not to Love." In the meantime, Manson began gathering followers, and they decamped in November 1968 for the Spahn Ranch, a spot northwest of the San Fernando Valley where westerns had been filmed in the 1940s and '50s. There, they spent a lot of time tripping on LSD and swapping sexual partners. It was here that Manson got it into his head that the Beatles' song "Helter Skelter" and the Bible's Book of Revelation were predicting a race war. It was also here that he hatched an evil plan to commit a series of murders that he believed would spark a final confrontation between blacks and whites in America. Manson told four of his followers — Susan Atkins, Charles "Tex" Watson, Patricia Krenwinkel and Linda Kasabian — to grab their knives and head over to what he believed was Melcher's home at 10050 Cielo Drive. His orders were to kill everybody inside. The next day, Manson's followers butchered Leno and Rosemary LaBianca in their home. The words "Death to Pigs" and "Healter Skelter" (misspelled) were found printed on a wall and a refrigerator door. "Mr. and Mrs. America — you are wrong," he said. "I am not the King of the Jews, nor am I a hippie cult leader. I am what you have made me, and the mad dog devil killer fiend leper is a reflection of your society. ... Whatever the outcome of this madness that you call a fair trial or Christian justice, you can know this: In my mind's eye, my thoughts light fires in your cities."